I have a query on earthing system design. One designer has submitted me an earthing plan which interconnects the earth electrodes meant for equipment earthing and those for lightning protection purposes. By combining the earth electrodes he achieves overall earth resistance below one ohm required by IS 3043 (Indian standard). But my question is whether this is an acceptable practice followed by industry or the earth electrodes of the two systems (protective earthing and lightning protection) can not be combined this way? Would appreciate feedback. thanks in advance. Answer from Didier Mignardot: When Lightning Protection System (L.P.S.) is implemented, all metal conductors (including the electricity distribution network) must be interconnected. or copy this trackback: http://engineering.electrical-equipment.org/iec-standard/earthing-system.html/trackback from your own site. Though making agrid helps in achieign low value of resistance, lighting protetionsystem earthing and power earthing needs to be kept separate.also, sensitive equipment earthinglike CNC m/c etc needs to be separate. Earth resistance value depends on soil resisitivity,the same needs to get tested. Alos now there are prducts like – pipe in technology based earth electrodes available to help achieve lower values and requirng no maintenance. No they don’t need to be kept separate. Or perhaps my copies of BS 7671, IEC 62305, BS 6651 etc. are different to yours?! thanks for this intersting Blog. I just want to know who are the sponsor of this blog. I want to be certain of neutrality of the contributors and moderator.I want to be certain that my e-mail will not be used by a company. As a well educated pernson, you should be able to judge wether the answer is biased or is professional. By the way, i am an electrical Engineers haviong more than 30 years of filesd experience. Existing standard IEC 60364-5-54 provides requirements for the selection and erection of electrical equipment – earthing arrangements, protective conductors and protective bonding conductors. These requirements only cover protection of persons against electric chocks. 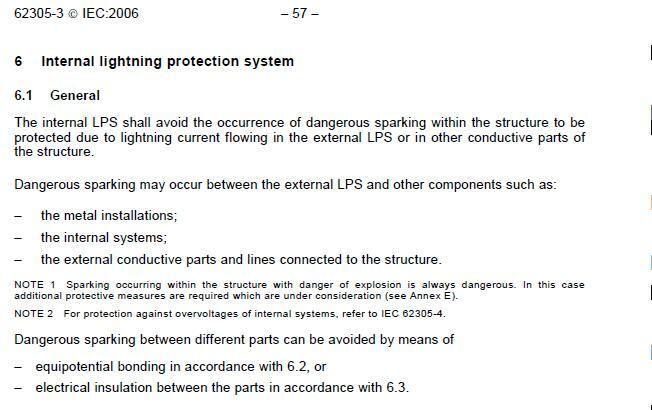 Series of standards IEC 62305 provides requirements for protection against lightning. Existing standard IEC 62305- 3 provides requirement for physical damage to structures and life hazards. These requirements only cover protection in case of lightning. To answer the question, it is possible to say that it is possible to erect only one single earthing arrangement, or to interconnect both types of earthing arrangements. IEC 60364-5-54 will be probably revised this way. EARTH pits can be interconnected. 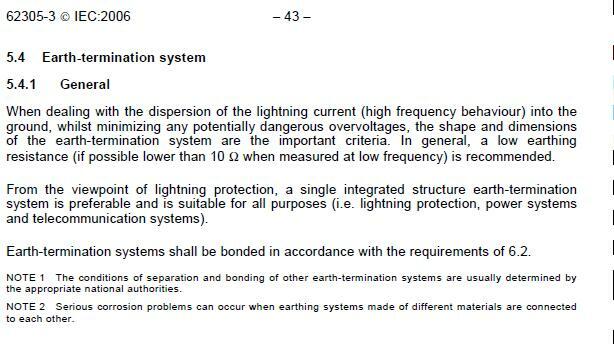 As per NEC standards/IEEE recommendations, we need to provide bonding between lightning earth grid and equipment earthing at least at two points. We can have a common grid also for lightning and equipment if both are adjacent. Check your design requirements accordingly. Earth pits should kept seperate for power and lighting .Earting rods are inserted in 8 ft hole and is filled by charcoal and salt becoz charcoal and salt are good conductor of electricity provides a good path for current in ground when fault occurs and hence resistance reduces ie less than 10 ohms. I don’t really agree with that as salt is a temporary solution for a lower resistance and increases the corrosion process on the electrodes. The carbon or charcoal as you call it helps increase the area of conductor to ground. For example. If you core drill a 60mm hole and insert a 16mm earth rod into the ground and cover the whole with normal soil, you conductors area to ground is only 16mm. But if you filled that 60mm hole with conductive cement, you have now increased the conductor area to ground to 60mm. This will make a minor diferrence in your resistance when tested, unless the area has been moistened. Nonsence. Why should they be kept separate? Set 1) The two earthing sets (or may be three, if there is a separate earthing set for the data & communication systems) and the earthing sets are not bonded above the ground level. In the event of a a heavy discharge on the lightining protection system, the lightining protection system will (at the time and for the duration of the surge) have a rather high voltage for the trancient period. If the lightning stroke produces a peak current of 1kA, then with a 2 ohm earthing resistance, the voltage at the top of the earthing set will be 2000 volts! And the stroke current could and in all probability will be far higher than the assumed 1 kA. This produces a peculier situation of a potential difference of 2kV between the distribution system as well as signal system earthing sets (assuming that they are separate earthing sets) and the earthing set of the lightining conductor system. In this case the entire earthing sets will have a transcient elevation of potential to 2kV with reference to the actual earth or zero potential body. Now such a temporary elevation of potential can cause breakdown of insulation at vulnerable points. Set 3) The earthing sets are physically separated by a signifcant distance and are bonded at the ground level. In such a case the while the lightning system earth will be elevated to 2 kV, the distribution earth set (and the communication earth set) will be elevated by a much smaller voltage, due to the impedance of the bonding link between the lightning system earth and the power distribution earth. As such the best practice would be to provide the three earth sets distributed in the space available as far or distant from each other as possible and also to bind them at the ground level so that all systems get the benefit of a lower effective earth resistance and the impact of a lightining stroke with a high transcient current and consequent short time potential elevation is reduced. Communication engineers quite often complain and request that the earthing sets for their systems be provided as far as possible physically from the distribution system earth as well as the earth set for the lightning so that the interference is attenuated. The best practice would be to keep the earth sets distributed at locations as distant from each other as is practicable from the site conditions and bond them at the earth level, with test links in the bonding line as well as in the earthing line, so that we do not become complacent during periodic maintenance check. These distances is depends on the length of the Earth electrode. i.e. the distance between the earth electrodes should genarally be two times of length of the electrode as genaral. for Ex. if of the electrode say 3mtr long, then the distance of electrodes will be 6mtrs. please give any further clarification/comments regards this. Good analysis. In my opinion it would be better to have common grid for electrical distribution system ( body ) and lightning conductor by interconnecting them through earthing grid below ground level . All earth electrodes (pits) shall be interconnected through this grid. But the conductors interconnecting the lightning conductor/ arrester body to earth grid above ground surface should be through insulated casing / pipe to avoid shock due to potential diff. arises during the time of discharge of lightning stroke current which may last for few cycle. please if possible i need Siemens handbook or the book that completely talk about earthing system. I do not know whether the Siemens Handbook is available to outsiders. Gives good information. There are also links to other websites. In the case of buildings one way of easily getting or building an earthing system, which generally gives a low earth resistance, is the UFER Earthing. At the foundation stage generally a layer of lean concrete (for levelling purpose) is put before the structural concrete or reinforced concrete is put. In this layer of lean concrete bare copper wire or copper tape is laid in long lenths of about 6 to 10 meters in the foundation raft (or in a zig zag manner in case of colum footings or the cap of pile clusters). The conductor in brought out in a protective GI Pipe or a PVC pipe outside the building line. A number of such earth sets can be laid at the foundation time with practically no extra cost for excavation. Wherever we have provided such electrodes we have noticed that the earth resistance is lower than the other methods of earthing. Moreover the low value is retained for a long time. NEC mentions the UFER Earthing. But many other national standards do not mention this or its varient. Authorities such as High Voltage department of Indian Institute of Science, Central Electricity Authority, Chief Electrical Inspector of Delhi, have accepted this practice, (1)for neutral earthing, (2)for equipotential bonding of non-current carrying metal parts of electrical equipment (3) Lightining conductor system and (4) communication and data system earthing. 3.Other sensitive-UPS,CNC,Com., separate and connected to main earthing system. Normally, we should have 2 seperate Earthing Points, 1st is special for LV where the resistance value is ” around 1-3 ohm for NT-S, NT-C, IT “, and the 2nd is special for Lightning System where the resistance value should be ” smaller then 10 ohm “, but in some places ” Closer ” we should connect between them by a ” 25-35 mm2 Copper Conductor ” that we scalled ” Equipotential Conductor “, where the gole is to have the same Potential for both when there’s a Lightning crurrent flows. We have a problem of frequent damage to variable frequency drive and PLC controls. Some engineer now suggest that we now should have separate earthing embedded in ground for every 3 machines i.e. we install new 12 earthings and take the separate conductor to each set of 3 machines? Also earthing should be used ALSTOM ? We request you to suggest. it is good initiative.Use advance pipe techniques to get max.condutivity path and tes the soil. Interesting thread but has many misleading and misunderstood statements. Very useful practices/codes are IEEE Std 1100-2005, IEEE 142-2007, NFPA 70-2011, NFPA 780-2011. The noted IEC stds are also useful. Generally, the best grounding/earthing for a facility is ONE intergrated grounding electrode system (GES) for all affected entities including power and lightning. Even if lighting has dedicated GES it should be directly bonded to the power GES and the structure GES (if there is one such as a foundation electrode). The intent is to get the entire facility to rise/fall together under transient conditions within the GES. CNC machine providers used to insist on a separate earthing/grounding electrode because they misunderstood the actual problem had to do with the equipment grounding system (ac power wire, etc.). There is much misinformation re grounding for electronic equipment. IEEE Std 1100-2005 is useful and recommends decoupling the ports from grounding dependence via fiber links, optocouplers, digital isolators, etc. Remember, a laptop PC does not need a “ground” to work properly. I’m involved with several stds developments in North America and have considerable exposure and experience on these subjects – theory, application and site work. Good luck. I want to know how the neutral and ground wires are looped into the earth through copper pipes. How long is the copper pipe needed to be inserted vertically into the earth soil ? Looking forward to read from you soon. thanks for the interesting site…I just wanna know about the position of three electrodes. I’m not sure which of the electrodes should be changed from its actual place, but I just wanna know, why should it moved? Simple, why should the electrodes should be changed? i cant find any grounding stardard with regards to the distance between grounding rod, and the distance of grounding ring from the building. Hopefully this blog can help me. in block mill at the time of full load means materials in the mill the control lights are glowing can u give me any solution? Good am fellows.Can anyone know how many meter is the required (distance/by meter) of earthing system installation at the process area pipe rack.As we have already a loop earthing on the pipe rack perimeter but on the structural pipe rack is there any standard?please reply! Hi every ones, each and every earth pit are required interconnection but equipment riser are need to be connect with common grid, and neutral earthing/lightening earthing is direct connection with electrode, and connection is done with welding instead with bolting. ya! there is no mention of distance between two earth pits in any standard. This should not be less then twice the length of electrode buried in soil. Please refer IS 3043 dealing with this subject. I did not find this mention in IS 3043. Can you please guide me for page no. ?? Standard tables are available in any elect. engg hand book. Sir, Want to know what should be the min/max distance between the earth pit and the equipment to which it is connected. Is there any standard if so can I know which standard refers to it. Thanks in advance. Hi, Is chemical based earthing confirmed in IS 3043. Is it recommended. AM grateful for your unceasing effort in this regards, also appreciate your contributions to electrical engineering. pls accept my humble appreciation. pl continue to send me this newsletter. i wish to contribute soon. what is test link in case of earthing system? Test link is provided near or inside chamber of each earth pit or near to connected body. It is a small length of GI or Copper strip connected between the conductor connecting earth pit or equipment or earth grid with nut bolts. The purpose of this is to isolate a particular earth pit electrode from rest of the earth grid or equipment for testing purpose. By removing the test link the electrode is isolated from the grid equipment which may have connection to other earth electrodes. Thus this facilitate measurement of resistance of that particular earth pit which is isolated for test purpose. just what I’m looking for. Does one offer guest writerѕ to write content for yourself? on most оf the subjects you write in relation to herе. anybody can assist me to get more than 1000 ohms between 2 earth pits? Dear Sir’s, Can any one let me know – How many equipment earthing/ body earthing can be connected to 1 single earthpit.